doi:10.4236/ijcns.2010.33032 blished Online March 2010 (http://www.SciRP.org/journal/ijcns/). also considered, leading to significant qualitative and quantitative improvement of the processed profiles. Signal-to-noise ratios and dynamic ranges improvements as high as 50 dB have been observed. 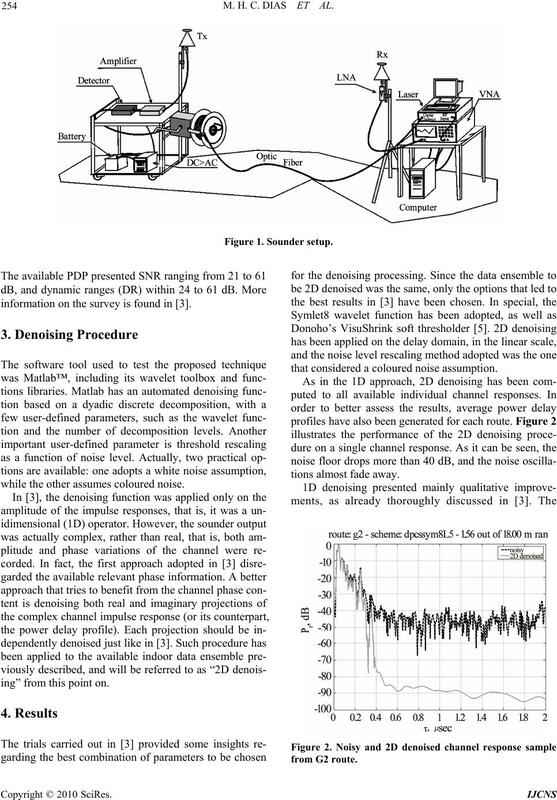 out on measurements of the channel impulse response. monly referred to as power delay profiles (PDP) . creases on signal-to-noise ratios (SNR) of the profiles . is carried out, to further improve the data processing. sampled at a 1/801 rate. sponses have been measured, from 13 different routes. M. H. C. DIAS ET AL. information on the surv ey is found in . while the other assumes coloured noise. ing” from this point on. that considered a coloured noise assumption. 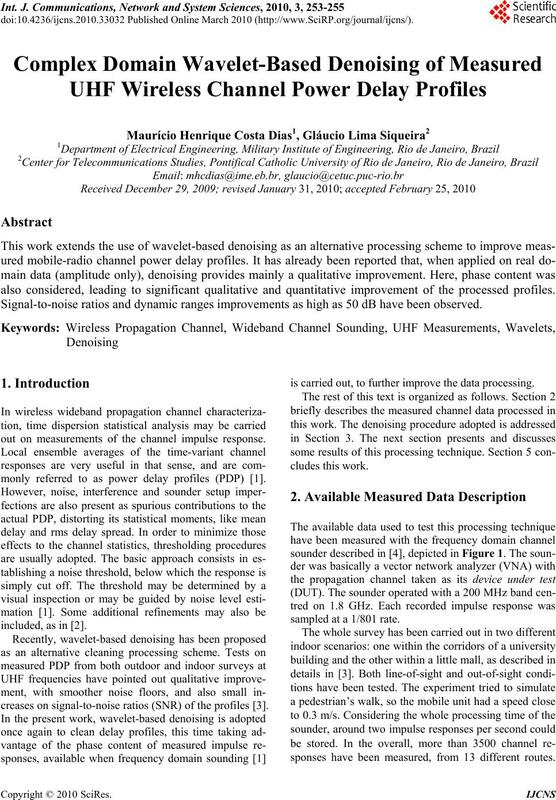 achieved, against 3 to 6 dB provided by 1D denoising. been tested to confirm such peaks as valid ones. also consi dered (2D de n oi s i ng). 6 dB when 1D denoisi n g was ado pt ed . IEEE Transactions on Vehicular Technology, Vol. 43, No. 4, pp. 837–847, November 1994. Wireless Personal Communications, Vol. 32, No. 2, pp. Vol. 1, pp. 375–379, May 2002. 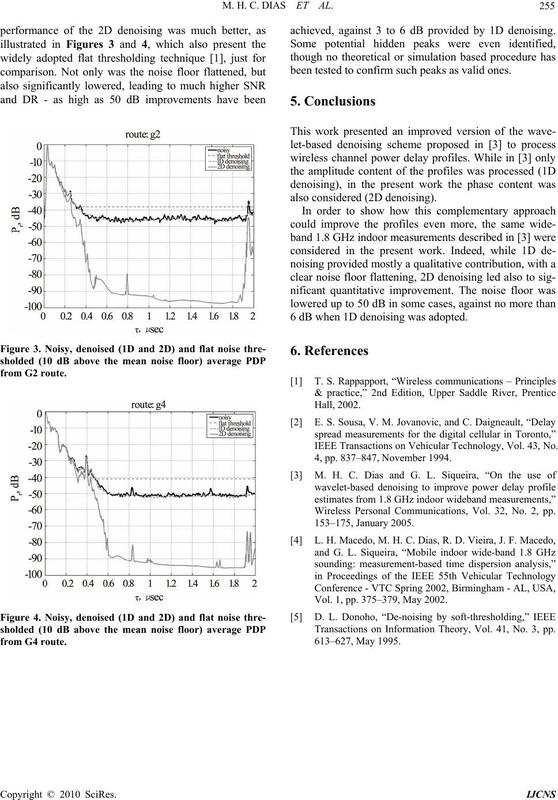 Transactions on Information Theory, Vol. 41, No. 3, pp.